Ive got a Google Drive spreadsheet that is shared with a specified number of people. At one stage there was possibly a Google Apps Script as part of the spreadsheet, but i think this is now removed. But the banner at the top says the last change was made by anonymous... how can this be? 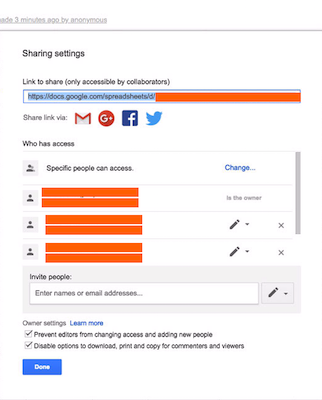 If you shared the file as a link and had permission set up with "Anyone with the link can edit" then all someone needs is a link to edit the file. If the person who edited the file is not logged in with his/her G Suite account then all the edits made would appear under "anonymous". It's possible that someone you shared the document with is editing it while not being signed in; or you shared it with the setting 'anyone with the link' and it was forwarded. Why are my edits and presence anonymous in Google document when I'm signed in? Is it possible to prove that a document was shared at a given time? “Anonymous Animals” in Google Drive: for not-yet-accessed shared file? How do I email collaborators on a folder or Word document in the New Google Drive? Is it possible to be “invisible” in a Google Drive document /spreadsheet?